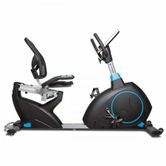 The Lifespan RC-300 is a large semi-commercial recumbent stationary exercise bike packed with tonnes with features such as MP3 Plug-in, iPad/Device Holder and smart built-in programs for a highly effective workout. Recumbent exercise bikes are great as they allow for the user to work out in a comfortable seating position that does not place any strain on the lower back. Programs includes User, HRC, Watts, Interval training programs. Am very pleased with this item came within the week and after Hubbie helped me take it out of the box I was able to put it together in about 1 12 hours could have been quicker but I just took my time. Everything was there instructions were good although took a while to realize that some of the screws were where they were supposed to go and not in the plastic bag also a couple of bits were for packaging only not stated in the instructions. Overall very happy with the purchase and price.